Christopher Chen’s latest play, Mutt, has a few superficial similarities with Warrior Class, Kenneth Lin’s drama that played TheatreWorks last year. Both center on Asian-American politicians that represent the Republican Party’s best hope for an Obama of its own. But what the two plays do with that subject matter is very different, and thank goodness for that. 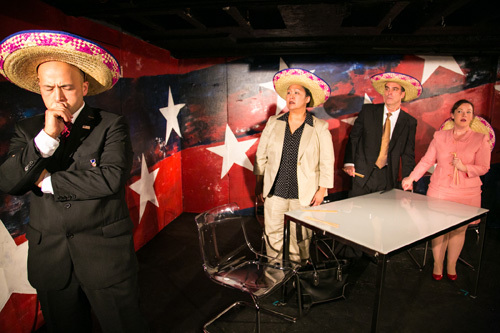 Chen’s play is a satirical comedy rather than a drama, for one thing, but it also takes on race politics in America in a much more direct and satisfying way, appropriately enough for a play whose subtitle is Let’s All Talk About Race! Michael Uy Kelly, Michelle Talgarow, Lawrence Radecker, and Patricia Austin in Mutt: Let’s All Talk About Race! Photo by Cheshire Isaacs. It’s also a refreshing treat to see a flat-out comedy from Chen after his marvelously, dizzyingly complex The Hundred Flowers Project. Before that the only play of his I’d seen was The Window Age, an odd little drama about Virginia Woolf meeting Sigmund Freud (or rather thinly veiled stand-ins for each) that he wrote for Central Works in 2009, so it’s fun to see this side of his work. Fast and loose and often outrageous in a rollicking staging by director Evren Odcikin, it’s also tailor-made for the aptly named Impact Theatre. This one’s a coproduction with Ferocious Lotus Theatre Company, a new company dedicated to producing work involving Asian-American theatre artists. They’ve called in a race consultant (Michelle Talgarow, brisk and unflappably professional.) to help the GOP’s race problem, and she counsels them to get an Asian candidate. “Asians are what we in the biz call the safe minority,” she says. “They are, in short, white.” But not too Asian. She advises them to get a hapa—a Hawaiian-originated term that’s come to mean someone of mixed, part-Asian heritage. Matthew Lai is the heart of the piece as Nick Wong, a contemplative, earnest Hapa congressman who goes on a soul-searching journey after he’s rejected in favor of Len Smith, a compellingly charismatic manly-man “superhapa” made up of “every major race in the world.” It doesn’t matter that Len, played with alpha-male charisma by Michael Uy Kelly, has absolutely nothing to say, because he says nothing so damn smoothly. “It was a small town that was one of many small towns that were small towns because they were small towns,” Len says, majestically describing his humble origins. Lai is also priceless as a blowhard political talk show host with shellacked platinum hair, feeding opinions to interviewees who parrot them back to him. Radecker and Austin later double as self-satisfied Democratic Party officers almost as absurd as their Republican counterparts. (Radecker’s character Mikey can’t say any words other than “middle class.”) Austin and Kelly also have an amusing scene as Nick’s forgetful, smartphone-glued parents. There are some running gags that never quite make sense, such as a breezy DJ voice announcing, “It’s nighttime! It’s daytime!” in the middle of scenes, with correspondingly abrupt shifts in Jax Steager’s lighting. The ending is intentionally but jarringly abrupt. Overall, however, it’s a smart and downright hilarious political comedy that plays dumb brilliantly. Show #43 of 2014, attended May 4.